Achieving a supported resonant tone in your band has never been easier! A tool that can be used with beginning, middle school, and high school students. A faster and more efficient way to teach air flow and articulation! Use With the Entire Band! Provide all wind band instruments with a visual way to understand their air stream. 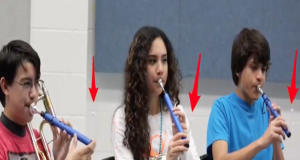 Students see how air is used for tone production, dynamics and articulation. Provide a specific air goal for faster retention of learning and building muscle memory. Students are active in monitoring their progress. Keep students focused on a target. You can vary intensity of airflow by changing resistance. Allow low brass to have a modified air flow to facilitate slow lip vibrations for learning low register. Save time in class. Director can see who needs individual help without hearing everyone one at a time. Help with all air related concepts. Provides constant feedback. Click on this link to view an introduction video about the product. Work on Multiple Areas With One Tool! Lets students see results of air flow. Build air awareness through basic breath exercises. Students can feel muscles work as they activate air flow. Shows brass that air velocity must increase for upper range to support embouchure. May be used to strengthen breathing mechanism. Sets visual representation of air flow to produce a resonant tone. Builds muscle memory of what it feels like to produce a resonant tone with consistent air flow. Focus on different ranges. Increase resonance and achieve better intonation in upper brass range. Get more feedback on your flexibility and long tone exercises. Students and teacher can see immediately if air flow stops during articulation. Students can feel and see the physical difference between legato, staccato, and slur. Develop the proper air stream for double tonguing right from the start. Keep the air flowing on the second syllable. The resonance trainer has a receiver that allows for your woodwind (Flute, Oboe, Clarinet, Bass Clarinet, Bassoon, Alto Sax, Tenor Sax, and Bari Sax ) and brass students (Trumpet, French Horn, Small bore Trombone/Baritone, Large Bore Trombone/Baritone, and Tuba ) to use their mouthpieces in order to benefit from use. The Resonance Trainer was designed by band directors (Hector Perez and Steve Giovanoni) for band directors. It was developed out of a need to improve student comprehension about air flow. They felt their students were not understanding how they were negatively impacting their own performance by allowing other physical actions to interfere with their air flow. The Resonance Trainer was the solution to this issue. A visual representation to air flow. Students can now see, hear, and feel what will happen with their instrument’s air flow due to other physical actions they exhibit. It is strictly a tool for improving fundamentals of performance for wind band instruments. It is not a program unto itself. It is designed to be used in conjunction with your program as you see fit. We have created some videos for teachers and students to watch as a guide to some of the possibilities of this tool. These will hopefully inspire other ideas as to possible ways to perform the exercises and warm-ups that are employed in your program to the Resonance Trainer. The Resonant Trainer is designed only for use as an instrumental music teaching device. It is specifically designed for use in the band class. Any damage or injury that results from the misuse of this device is the sole responsibility of the individual and not Resonant Innovations LLC. Persons with any respiratory conditions such as asthma should consult their doctor before using this device. Please download and save the pdf to your desktop. Complete the form and then either email the order form, or you can print it out and mail it via the postal system.